Our family has a mutual understanding that, although we might have outgrown Easter egg hunts, never under any circumstances shall we outgrow chocolate Easter eggs, particularly if they are piled atop Triple Chocolate Easter Cake. Although my Grammy stopped hiding Easter eggs years ago, to the great appreciation (and relief) of her family members, she has maintained the role of Easter Bunny. Each year, she leaves a selection of candy beside our plates at Easter dinner, and we walk away with enough chocolate Easter eggs to satisfy our sweet teeth for weeks. Today, I’m stepping in for the Easter Bunny (and Grammy) by delivering an Easter cake that will please chocolate lovers of all tribes. 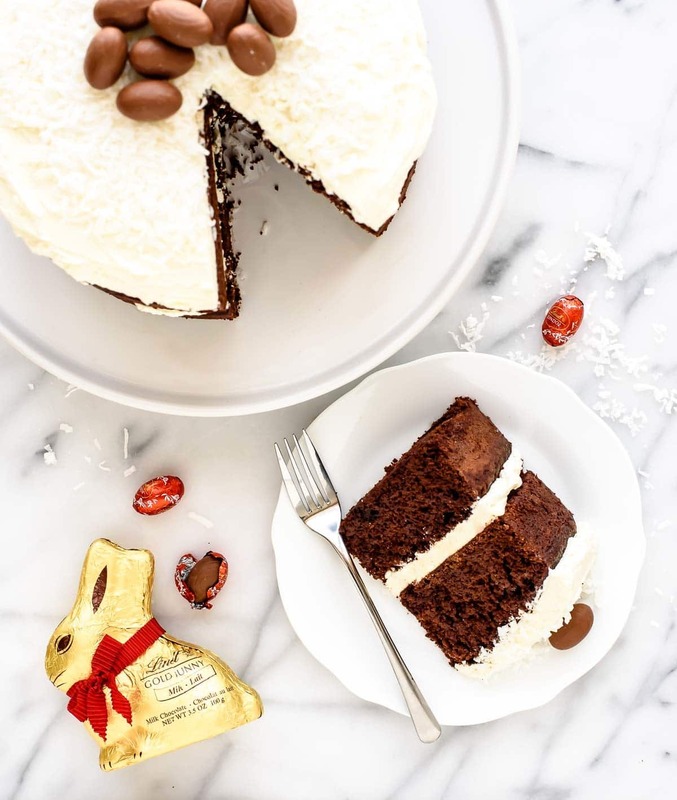 Whether you are a dark, milk, or white chocolate devotee, this Triple Chocolate Easter Cake will have you polishing your plate while wishing you’d cut yourself a larger piece. 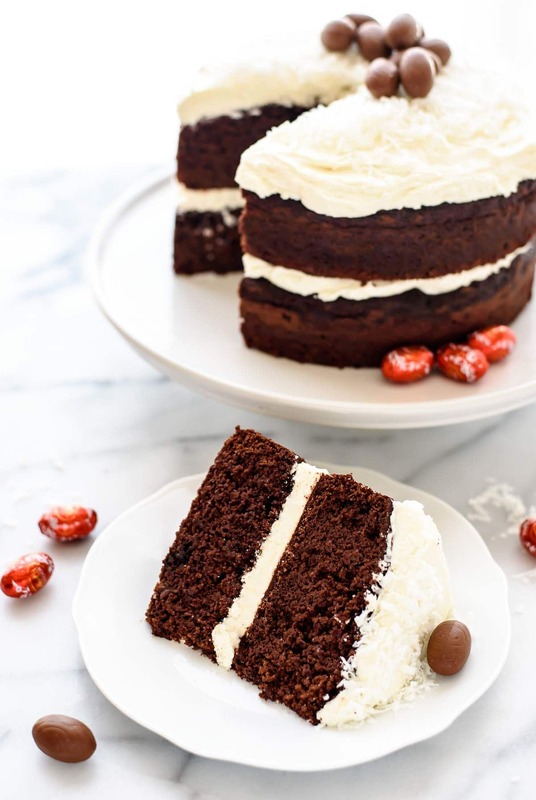 Two layers of moist, decadent dark chocolate cake, slathered with fluffy white chocolate buttercream, and topped with milk chocolate truffle eggs, this triple chocolate cake would have even the Easter Bunny licking his paws. The cake crumb is tender and fudgy, the layers tall and proud, and the presentation beautiful. It’s everything I could ask for in my chocolate cake, with extra chocolate on top! The most essential component to baking a chocolate cake that will wow the crowd is the quality of the chocolate itself. I used Lindt EXCELLENCE 70% Cocoa Dark Chocolate for the chocolate cake layers and Lindt CLASSIC RECIPE White Chocolate for the white chocolate buttercream frosting. Both taste outstanding, are ideal for baking, and give the cake a rich, pure chocolate flavor. I’m usually more of a cake-over-frosting kind of girl, but this white chocolate buttercream is an exception. Its creamy, light flavor delicately enhances the dark chocolate cake layers, so don’t be afraid to pile it on thick. To give the triple chocolate cake a festive Easter look, I sprinkled coconut on top in the shape of a nest, then arranged Lindt LINDOR milk chocolate truffle mini eggs in the center. Since I typically gravitate towards dark chocolate, this was my first time trying the milk chocolate eggs. Oh. My. Word. I didn’t think I liked milk chocolate, but it turns out, I’ve just been eating the wrong kind. The milk chocolate truffle eggs are melt-in-your-mouth creamy without being overly sweet, and I haven’t been able to keep my hand out of the bag. For a final chocolate touch (because why go for chocolate three ways when we can squeeze in a fourth? ), I nestled a Lindt GOLD BUNNY beside the cake. My Grammy always places a few of these iconic chocolates at our Easter table, and they are a fun way to make this Easter cake even more festive. If you are not yet convinced to bake this Triple Chocolate Easter Cake, I have one final endorsement. My sister and baby niece came to visit over the weekend, and when my sister came to the painful realization that she wouldn’t be able to carry a slice of the cake onto the plane with her (apparently extra diapers take luggage priority), she reached a fork into the fridge and took one last large, wistful bite…at 7:45 a.m. as we rushed to the airport! 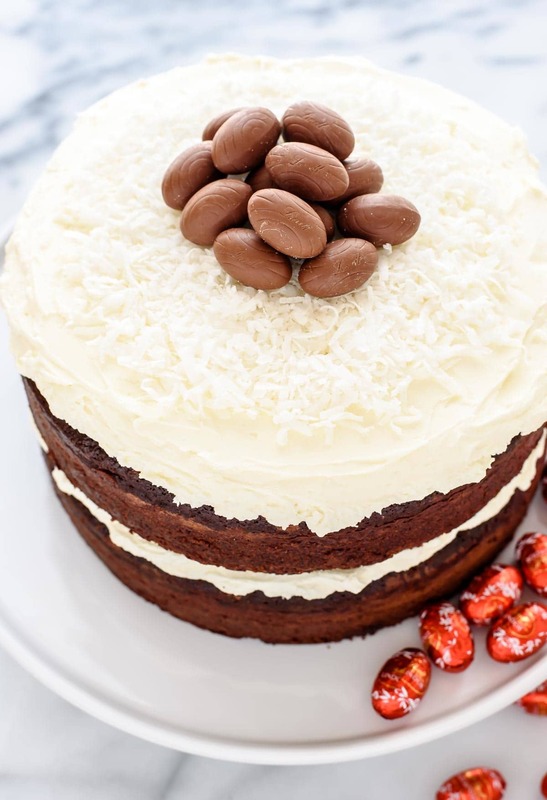 The most moist, decadent triple chocolate cake, topped with flaked coconut and chocolate Easter eggs. 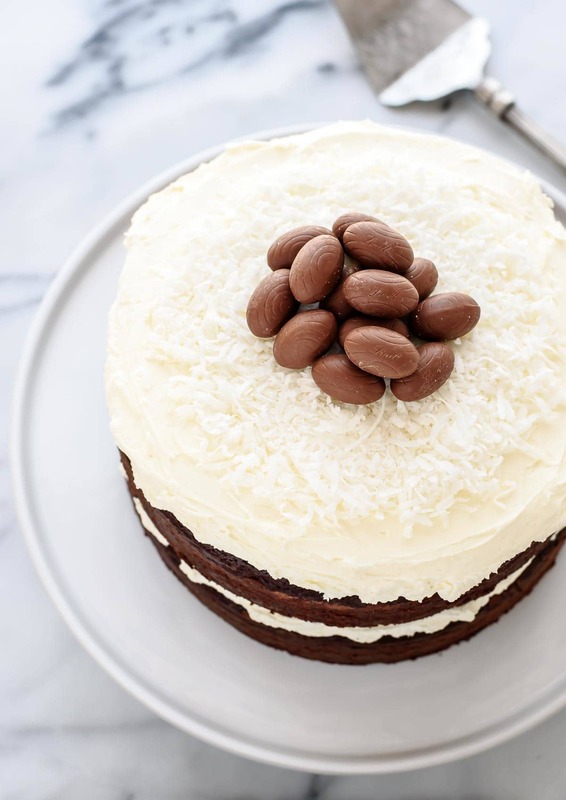 A simple, beautiful Easter cake that's to die for! Preheat your oven to 350 degrees F. Coat 2, 8-inch round cake pans with cooking spray, line the bottoms with parchment paper, then spray again. Dust the pans with cocoa powder, then tap out the excess. Sift 2/3 cup cocoa powder into the bottom of a medium mixing bowl. Pour the hot coffee over the top, then add the finely chopped 70% chocolate. Stir until the mixture is completely smooth. Set aside and let cool to room temperature. In a large mixing bowl, beat the butter for 30 seconds, then add the sugar and vanilla. Beat on medium speed for 1 full minute. Add egg whites, 1 at a time, beating well after each addition. Add the whole egg and beat again until fully incorporated. Add the Greek yogurt and beat for a full 2 minutes. In a separate bowl, whisk together the cake flour, baking powder, baking soda, and salt until well blended. Add 1/3 of the flour mixture to the butter and sugar mixture, then beat gently to combine. Add half of the chocolate coffee mixture, beat to combine, then continue adding the next 1/3 of the flour mixture, the remaining 1/2 of the cocoa mixture, then the final 1/3 of the flour mixture, combining well between each addition. Beat the batter just until the ingredients are blended. Divide the batter evenly between the prepared pans and smooth the tops. Bake the cake layers for 32-36 minutes, or until a toothpick inserted in center comes out mostly clean with a few moist crumbs clinging to it. Place the pans on a wire rack. Let cakes cool in the pans for 10 minutes, then gently remove the cakes from the pans and transfer to the wire rack to cool completely. Discard the parchment paper. To prepare the white chocolate buttercream frosting: Melt the white chocolate in a microwave safe bowl or a bowl set over a pan of simmering water, watching carefully so that the chocolate doesn't burn. When the chocolate has almost completely melted, remove from the heat and stir until smooth. Let cool to room temperature. In a medium bowl, beat the butter on medium speed for 1 minute. Reduce the mixer speed to low and slowly add the sifted powdered sugar. Once combined, add the melted and cooled white chocolate, then increase the mixer speed to medium and beat the frosting for 2 minutes, until creamy. Add the almond extract, and salt. Beat for 30 seconds, until well combined and smooth. 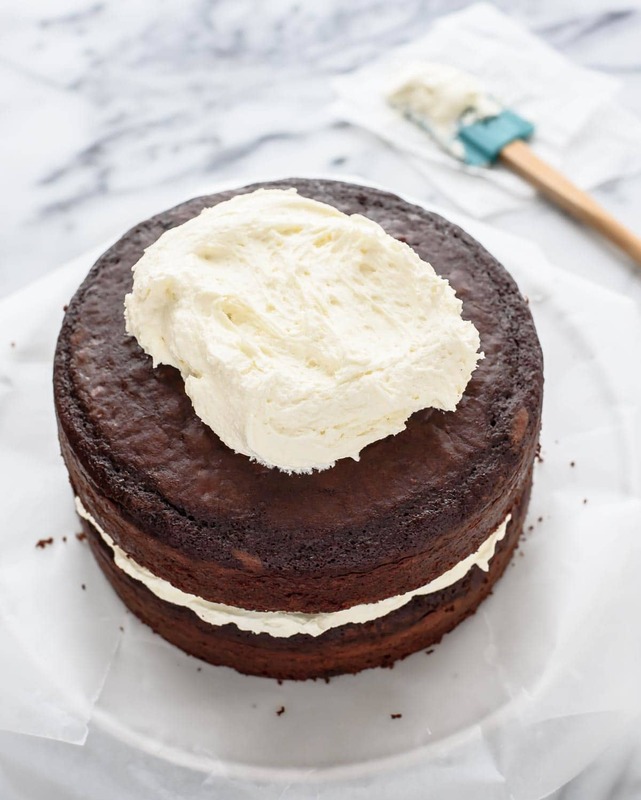 If necessary, trim the top of a cake layer so that it is relatively flat. Place the bottom layer of the cake on a serving plate or cake stand, flat side down. Tuck wax paper strips all the way around the bottom edges of the cake so that they poke out of the bottom. Spread white chocolate frosting over the top of the cake layer, then gently place the next cake layer on top, flat-side down. Spread top of cake with desired amount of remaining frosting. Sprinkle flaked coconut in the center to create a "nest," then decorate with mini chocolate eggs. Store in the refrigerator, but let stand for 30 minutes at room temperature prior to serving. Cover leftover Triple Chocolate Easter Cake tightly with plastic wrap and store in the refrigerator for up to 3 days. Let come to room temperature prior to serving. Chit chat Easter (and chocolate!) 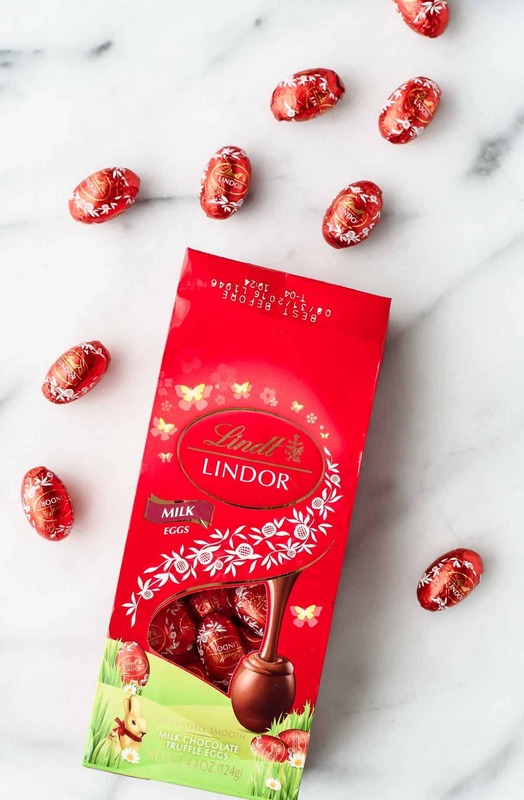 On Monday, March 21 from 8 p.m. to 9 p.m. EST, Lindt will be tweeting using #LindtGOLDBUNNY and talking all about Easter traditions, crafts, and of course recipes! All are welcome. Come find fun Easter ideas and share yours too. 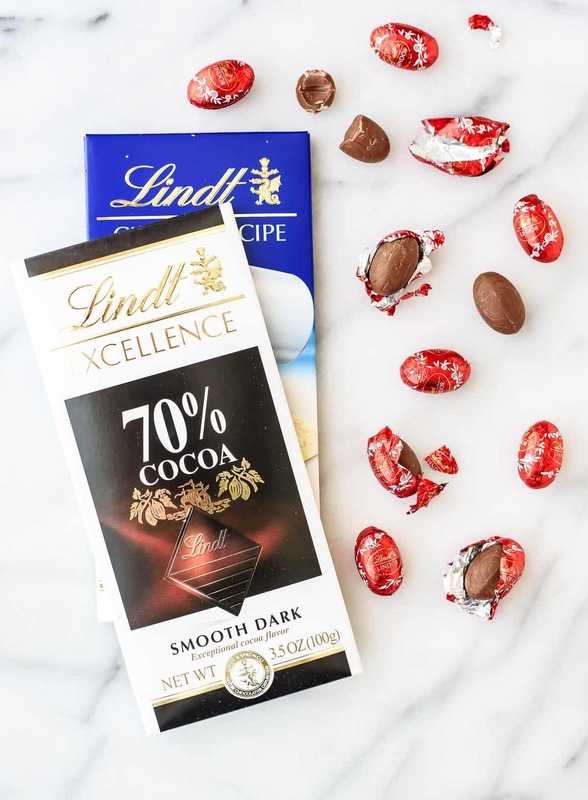 I am sharing this post in partnership with Lindt. As always, all opinions are my own. Thank you for supporting the brands and companies that make it possible for me to continue providing high quality content to you! hey girl this would be so awesome! I love chocolate of any kind! Oh my god!!!!! This looks absolutely delicious! I love the layered look (I’m not a fan of covering a cake completely in icing) and those couple of Easter eggs on top are gorgeous. Mouthwatering! I was wondering if their was High Altitude instructions for this recipe? Erika, I’m sorry, but I do not! I don’t have experience with high altitude baking. If you want to try the cake, I would suggest following the guidelines that you use for other chocolate cake recipes. I’m sorry I can’t help you more! Thank goodness for grandmas and all the sweet treats they give/make for us on holidays! This cake is so pretty and I love all the chocolate goodness in and on it! How cute is this cake, I love that you put the chocolate eggs on top. It’s a beautiful cake, trying out the reciepe tonight? Carlin, I am SO happy to hear this! Thanks so much for trying the recipe and taking time to leave your review. It means a lot and is so helpful to others too!